You are at:Home»Software»Prepar3D V4.1 Release Date Announced! Prepar3D V4.1 Release Date Announced! 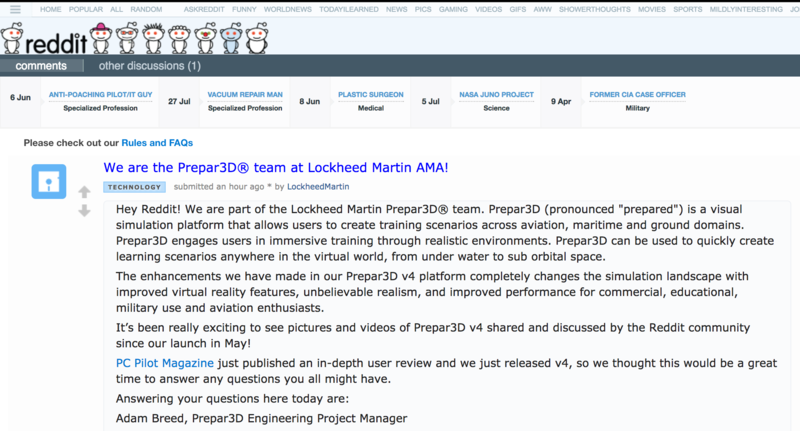 The Lockheed Martin Prepar3D Reddit AMA has been going for almost 40mins as I write this, but just over 15 mins in a bombshell was dropped! Prepar3D Version 4 was released 30th May much to the relief of die-hard Prepar3D fans and was widely received very positively by the community. There’s been no mention of what the changelog will consist of but we can all but guarantee a sea of bug fixes will be included. Previous ArticleREX Latitude Shutting Down! Next Article Aerosoft Newcastle X Released!